A 72-year-old woman suffered ‘serious injuries’ when she was in a collision with a bus at Warrior Square, St Leonards, according to police. 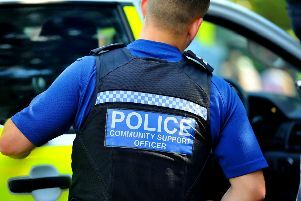 Officers were called to the junction of the A259 Eversfield Place and the A2102 Warrior Square, St Leonards, at 2.45pm on Wednesday (February 13). Police said the woman, from Eastbourne, was on foot in a bus lane. The Kent, Surrey and Sussex Air Ambulance attended but the woman was taken by land ambulance to the Royal Sussex County Hospital, Brighton, where she received further treatment. No one else was hurt, according to police. A spokesman for the South East Coast Ambulance Service (SECAmb) confirmed a woman was taken to hospital and described her injuries as ‘potentially serious’. Chelsea Jadè said the injured woman was her nan Kathleen who suffered a broken eye socket and cheek bone as well as a bleed on the brain. She said: “I would like to thank the police, ambulance services and everyone who helped my Nan at this incident. “She has 43 great grandchildren/grandchildren who love her very much. “We are a very big family who would love to say a great big thank you to all emergency services who responded so quick to help my nan. She asked people to contact her on Facebook. Her account can be found here.